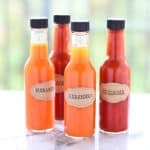 Homemade Hot Sauce: perfect for gifts + totally delicious! 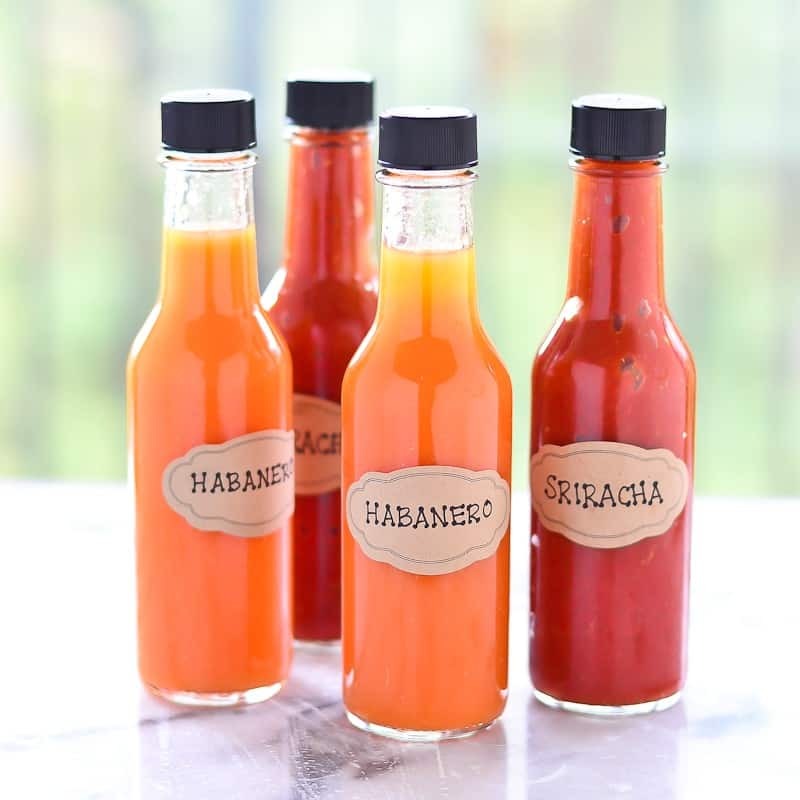 DIY Hot Sauce (Habanero and Sriracha) – it’s delicious, and totally worth a try! And, the two times we’ve gone back to visit our hometown, I’ve have to pick out all the peppers and dip all my food in tea (like a raccoon) to rinse off some of the spices before I can eat it. This, of course, horrified my relatives (“What are you doing???? You’re losing all the flavor!”) and embarrassed the hell out of my Dad. No one will ever let me live that down. My favorite pepper memory, however, is the time I made jalapeno poppers and accidentally got some pepper juices on my face. Genius that I am, I decided to wash my hands with some water and then splash it on my face to get that cleaned off too. Of course, capsaicin (which makes peppers spicy) is oily and floats on water, so all I accomplished was to get it spread all over my face. It took about 3 seconds for my world to light on fire – the capsaicin was in my eyes, in my nostrils, on my lips…I couldn’t open my eyes because they were burning and watering uncontrollably, and it felt like every part of my face was being stung endlessly by a swarm of giant, murderous hornets. I was literally screaming and ugly-crying from the pain. Dan, thinking I was being murdered in the bathroom, came running. To combat the pain, I tried a bunch of stuff. Scrubbing frantically at my face with soap only made things worse, because my face was already so sensitive. Dan read that dairy products were supposed to help, so I tried pouring buttermilk on my face. Nothing. So we moved on to Greek yogurt. That helped, but not for long. So then I tried dunking my face in a bowl of ice water. Again, it helped, but only for like 30 seconds. In the end, I spent about an hour hunched over my bathroom sink, alternating between smearing handfuls of yogurt on my face and dunking my head in ice water. Crying and moaning and drooling the whole time. It wasn’t my finest moment. After all that, I’m definitely a little gun shy around peppers. When I make jalapeno poppers now, I lean wayyyyyy back from the chopping board. Can’t go through that again. But I can’t avoid them completely, because I’m married to a man who loves them. And, for a second summer in a row, this man grew a bunch of habaneros, jalapenos, and spicy bells on our balcony. Last year’s crop went to waste, because I didn’t know what to do with them (and/or did not want to deal with them). This year, I was determined to turn them into something delicious (for him), ‘cuz he was so excited about his crop and asked me constantly what I was going to make with them. DIY Hot sauce seemed like the way to go – I couldn’t think of any other use for them, and there were so many peppers to deal with that I figured I’d share the wealth. It is almost holiday season after all. The habanero hot sauce scared me a little bit, because the steam coming off the pot while I was cooking it was super intense. It actually made the air in the kitchen and living room spicy. I only tried a little bit of it, and it tasted like liquid fire to me. But, both my coworker and Dan’s coworker (who gave us the plant), who were each gifted a bottle, said it wasn’t too bad. They were actually able to get past the heat and taste the other flavors of the sauce. Go figure. As for the Sriracha – it was spicy, but noticeably less so than the habanero sauce. I could actually taste the underlying flavors, and it was pretty good! Hot and tangy, with just a little bit of sweetness, and little umami thanks to the fish sauce. Definitely tasty – we kept a bottle for ourselves. What to do with a crop of spicy peppers? 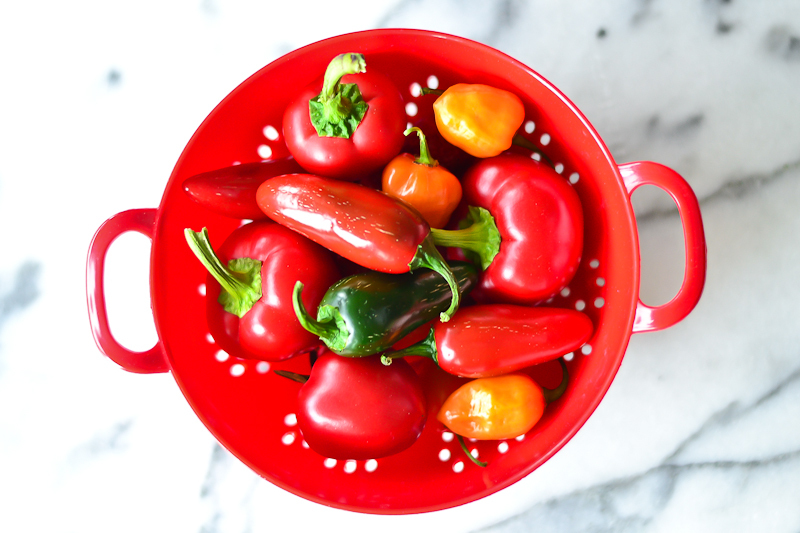 Hot sauce seemed like the way to go – I couldn’t think of any other use for them, and there were so many peppers to deal with that I figured I’d share the wealth. It is almost holiday season after all. In a dry pan at medium heat, roast your garlic, turning occasionally to toast and blacken on all sides. In a medium saucepan, add the carrot, onion, habanero, vinegar and water and bring to a simmer. Cook for 10-20 minutes until the carrots are tender. Put everything into a blender, including the (peeled) garlic, salt, and sugar. Blend until very very smooth. Feel free to strain the sauce to get out the thickest pulp and the seeds. Adjust with water to your desired consistency. Allow mixture to cool. Place all the ingredients in a blender (or food processor), purée until very smooth (there should be no visible bits or chunks). Pour the pureed mixture into a medium saucepan and bring to a boil over medium-high heat. As soon as it starts boiling, reduce the heat to low so that it is just barely simmering. Cook for 30 to 35 minutes, stirring every now and then. The sauce will thicken and the foam will subside as it cooks. Once cooked, take your pot off the heat and allow to cool slightly. Transfer the sauce to jars or bottles (I just barely filled two 5oz bottles). This entry was posted in Recipes, Recipes & Techniques by Cooks We Love, Salads & Dressings and tagged autoimmune disease, celiac, celiac disease, celiac health, food allergies, g-free, g-free diet, G-Free Foodie, gluten allergy, gluten free, gluten free baking, gluten free cooking, gluten free diet, gluten free dining, gluten free food, gluten free holiday. Bookmark the permalink.